David Lebovitz is hosting this months Sugar High Friday, and the theme is "Chocolate by Brand". 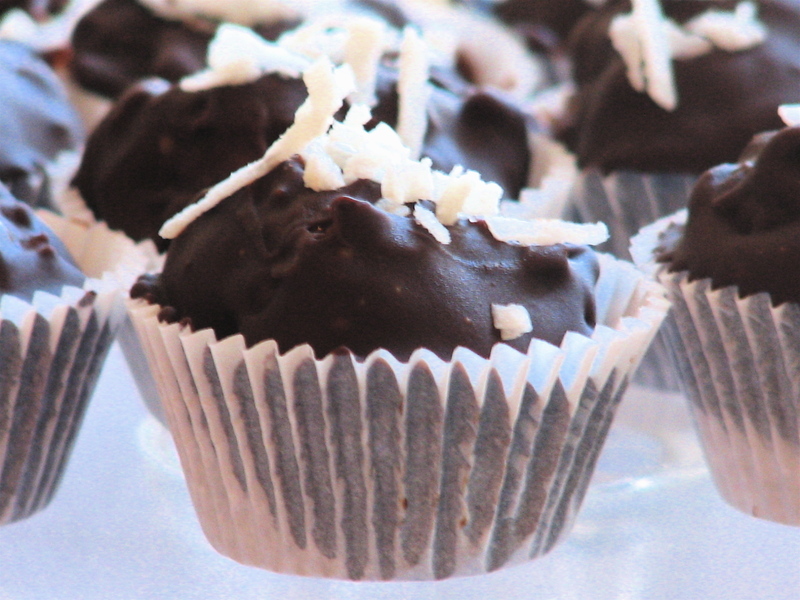 The chocolate that I used for these Coconut Patties was Ghiradelli's Semi-Sweet Chocolate. I know, nothing fancy. I buy it at the market across the street in these decent sized blocks and so for me, it's convenience and it's tried & true. I use it when making ganache, chop it up into chunks for cookies, or grate it onto ice-cream or cakes. I wish I could say that I branched out & bought this delicatable chocolate, but I went for the old stand-by. I went for something that I already knew I liked and that would more than likely work just fine. This was my first time trying this recipe and while it didn't dissapoint, I do think there are some things I would do differently next time. I decide to try this recipe (which hails from the "Spago: Chocolate" cookbook) simply because I love coconut and chocolate. It's called "Florida Chocolate-Dipped Coconut Patties" because when the author of the cookbook was 14, her family moved to Florida from Massachusetts. During the drive down, her Mother bought a box of coconut patties. They couldn't get enough of them and this recipe is fashioned after that sweet memory! Make the coconut filling: In a medium heatproof bowl set over a pan of simmering water, whisk together the confectioner's sugar, butter, egg white and salt until very liquid and warm to the touch, about 10 minutes. Remove from heat and, with a spoon, stir in the coconut and vanilla until well combined. Cover with plastic wrap and refrigerate for 1 to 2 hours, up to overnight. When ready to coat the coconut, in a small heatproof bowl set over a pan of simmering water melt the chocolate. When almost melted, turn off the heat and let the chocolate continue to melt completely, stirring occasionally. Keep the bowl over the warm water. If you are using milk chocolate, you will need to add 1 tsp of vegetable oil while melting. Form the balls: Line a small tray with parchment paper. 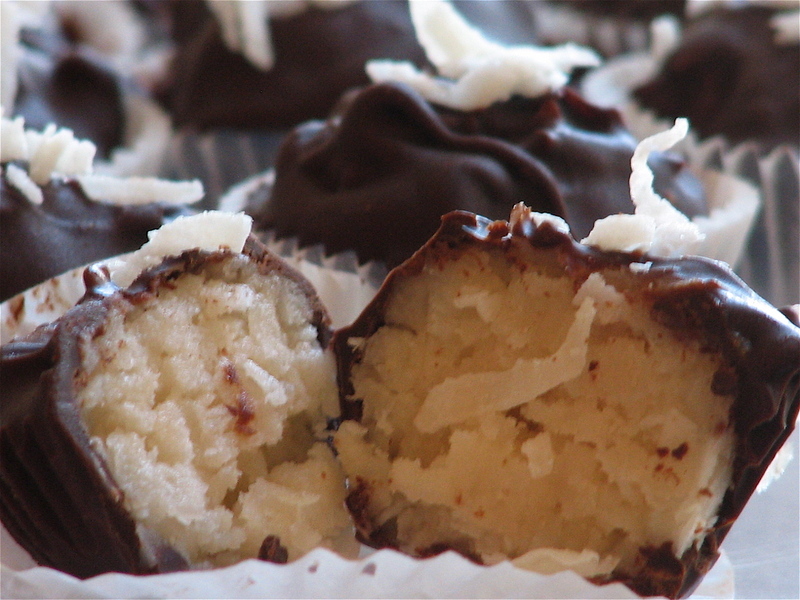 Using a scant ounce of the coconut mixture, roll into a small ball and place on the parchment-paper lined tray. (I used a small scoop to form the balls, to ensure they were uniform in size). Repeat with remaining mixture, forming 18 balls. Arrange 18 paper or foil mini-cups on the tray. Gently place one of the balls into the warm melted chocolate and, using two forks, roll the ball in the chocolate until well coated. Life (do not pierce) the coated coconut ball with one of the forks, allowing some of the chocolate to drip back into the bowl, and carefully place in one of the prepared cups. Repeat with the remaining coconut balls and melted chocolate. Refrigerate until the chocolate has hardened and use as desired. To Prepare ahead: Through step 5, the rounds can be prepared ahead and will keep for at least 1 week, refrigerated in a covered container. The only changes that I would make to this recipe, is to add a nut (I think macadamia would be divine) to the center of each of the coconut balls. As much as I love coconut, it's a bit too sweet and could use a little something in there. Also, once you've rolled the balls in your hands & placed back onto the parchment paper, I would refrigerate for 1/2 hour or so until they are firm to the touch. The heat from my hands made these soft when I rolled them and it was semi-disasterous when trying to roll them in chocolate. Also, I place just a tad bit of coconut on top, I think it's a little preview of what the eater can expect to find inside. I'm not sure why these are called patties, as they are clearly balls, but I'm sure they would be good too if you gave them a bit of a smush. Hope you enjoy! Sorry for all the recipes lately. I will be sure to get back to the crafty stuff this week! !